Machiavelli had it backwards. For us, it is not “the end justifies the means,” but the means that justify the end. In other words, you must pay attention to all the plastic means—light, line, color, space, subject, and tradition—as you search for the art in a painting. 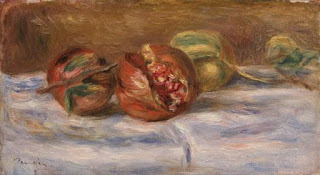 At the end of my last post (“Subject Facts, Picture Facts, and Us”), I asked you to examine two pictures: Renoir’s Pomegranates and Soutine’s Flayed Rabbit. I also asked you to reconcile, in each picture, if the starting point (aka the subject) affected the outcome (aka what effect, if any, did the subject contribute to the expressive meaning?). If it did, describe it. Your responses accurately stated the similarities: sinuous line and shape, juicy, rich, and vibrant color, and structurally rendered, centered volumes set off by a platform device. In each picture, the central volume is “split open,” or “exposed,” which one of you described as an “inside out” presentation. The two paintings are expressive of such qualities as dramatic activity, color richness, gritty unctuosity, and luminosity. In short, we feel differently about a depiction of a skinned rabbit on a tabletop than we do about pomegranates. How do those “human values” relate to the picture idea? In this case, I argued Goya rendered movement, power, and drama via a color statement. The color statement connected the plastic, aesthetic reality to the horror of the subject. The transformation into color converted our repulsion toward a brutal act into the order and consolation of art. We felt horrified by what Saturn did, but we enjoyed what Goya did. Pomegranates as a subject, therefore, can’t mean what a flayed rabbit can mean. We react differently to a depiction of a dead animal than we do to cut fruit, and the transformation into art does not do away with that difference. Rather, in the hands of an artist, as Dr. Barnes stated, both the intrinsic interest of the subject and the perfect coördination all the means, color, light, line, space, make up the total esthetic effect and can establish a painting as … a great achievement of plastic art no matter what the subject was and, in essence, the opposite: because of what the subject was. Here’s the way. Try objectivity. 1. Three globular volumes “float” in the shallow space of two undulating horizontal bands. 2. Glowing color chords of ribbon-like strokes build solid volumes: the central volume opens into a crevice composed of smaller orbs, ruby-like in color and sparkle. This “inside-out,” back and forth in space establishes the central theme. 3. To our left, the yellow/green color volume slips behind the central one causing the central volume to levitate. To our right, the smaller ruby-red color volume hangs in space barely touching the central one but gently vibrating next to it. 4. The brush strokes on the globular volumes create a soft, velvety, “skin” that appears thick yet supple, and connect with other brush strokes in the background, creating a gently curving, flowing movement. 5. In the lower brown band, darker shades of brown/red/and gray echo the roundness of the three volumes as well as move the eye back (on the left) and forward (on the right). 6. In the wider, upper “white” band, the horizontal color strokes of blue, pink, white, gray, and brown flow, ripple-like, toward the center. 7. At the top center, a series of short blue/gray strokes that say “fold” in the “cloth” connect, skewer-like, to the “peeled back skin” of the central volume in an arabesque that draws attention to its rhythmic counterpart on the bottom right where the smaller volume meets the brown background. Renoir’s picture holds together by a tightly knit continuous interflow of color. Solid color volumes infused with light join with the banded setting because of the interflow of their respective colors. Compactly organized ribbons of color flow throughout the picture. In this case, pomegranates on a table transform into a continuous sequence of arabesque-movement of line, light, color, volumes and spatial intervals varying in luminosity and definitiveness of shape. Foreground, middle ground, and background form an integral part of the main compositional theme, the arabesque-movement of solid volumes in colored space. 1. In this case, when the subject’s hold diminishes, the picture facts can be perceived with less emotion: a large central twisted mass of unctuous, contorted, pulled, smeared, vigorous, forceful brushstrokes pattern the highly luminous color shapes. The central mass is set off by the two receding slightly diagonal rectilinear flattened projectors: an irregularly shaped, crumpled “white” rectangle and a solid brown rectangle. These two areas are surrounded on three sides by a darker brown/black. This creates a pocket of space that “floats” the first two. 3. The “exposed” area that makes up the “body” reveals gristly, contrasted swirls of thick, vibrant, rich layers of reds, pinks, oranges, and brown/black. 4. Echoes of the central mass occur in the white “cloth”: the ovoid “body” appears in the upper right as a lighter circle of white within which grays and blacks recede; the foreground “legs” are echoed to their left and right; the “white cloth” pushes away from the upper left “leg” as the upper right leg sinks into it. 5. The brown “tabletop” equally pulses with swirls of pulled bands of color. Less “thick,” these color bands agitate and animate its surface. One of you argued that the Renoir painting portrays fruit, a subject that is life giving. 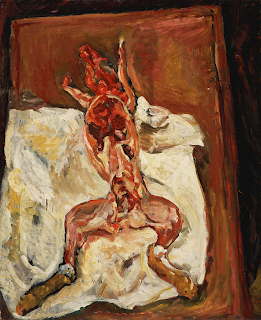 The Soutine blatantly displays death—a flayed rabbit—at its most gruesome—violent, bleeding and dramatic. Each of us will have an emotional response to the subject. Accept it. If we intend to make rabbit stew, a hunter, a butcher, or a cook will feel quite differently about the rabbit than those of us used to buying meat already cut and packaged and far removed from the slaughtering. We will feel differently about a pomegranate than we do about a skinned rabbit when we are in the grocery store, but when we are in a museum looking at a picture, we must connect our human emotions to the plastic reality depicted. So feeling is involved. Fruit as a subject has been used for centuries, but it is the individual artist’s conception of fruit that matters. Dead animals have been used as a subject for centuries as well. 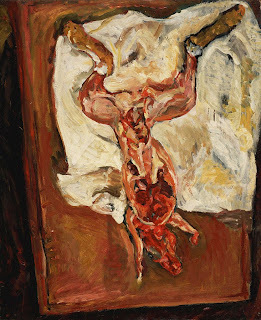 Soutine, himself, used all sorts of dead animals and fish as subjects: turkeys, sides of beef, ray fish, etc. And we respond to these differently if we feel compassion for suffering or if we feel contempt for the destruction of life. Illustration arouses sentiment, and this is legitimate it we respond to what the artist shows us, not to what he doesn’t. In the Renoir and Soutine paintings, the plastic means unite what the subject was with what the work of art demands: a visual theme that unifies all the means into a coherent whole. Think about Goya’s painting Saturn Devouring One of His Sons. 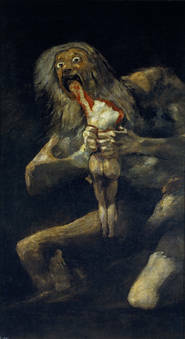 Here, Goya’s expressive illustration of an insane act of infanticide and cannibalism exaggerates the qualities that renders the subject repellent: dark/light drama; sharp, jagged angularity; light shapes emerge from darkness, and light shapes are sucked into darkness. No matter what feelings the subject may arouse in us, our job is to examine what we have in front of us: colors on a flat surface. And read them. I wish all my readers a wonderful holiday season. If you have questions or ideas for the next series of posts, just click here and send them to me. 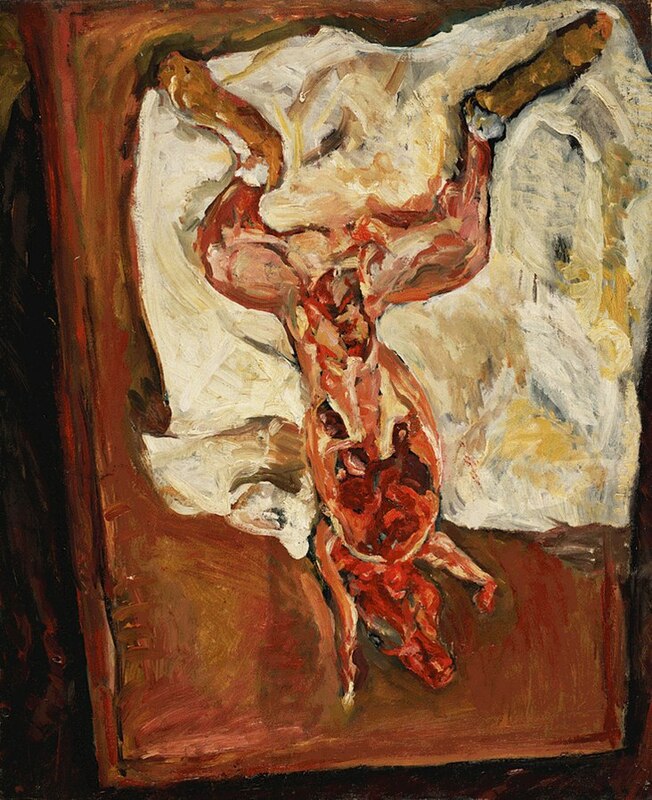 I still find Soutine to be less aesthetic (okay, ugly), especially compared to Renoir. Even upside down. Even without the subject. The quality of the color and the types of shapes are not as warm and inviting to look at. His work is cold, like a prison cell with a wet floor. Renoir is warm, like the first warm spring day. That's how the two feel aesthetically, even with no subject (to me anyway). 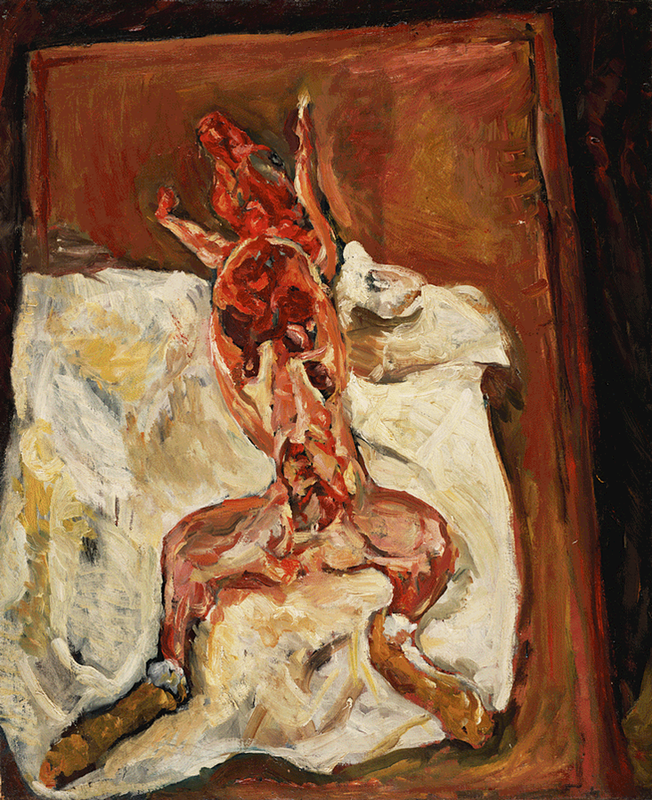 You are telling us "what you prefer," not what Soutine and Renoir express in their paintings. Many of us "prefer" the warmth, softness, and calm of a Renoir painting, while some people find his work too sweet. Sometimes we are in the mood for gentleness and calm, and sometimes we are in the mood for agitation, force, turbulance, and power. 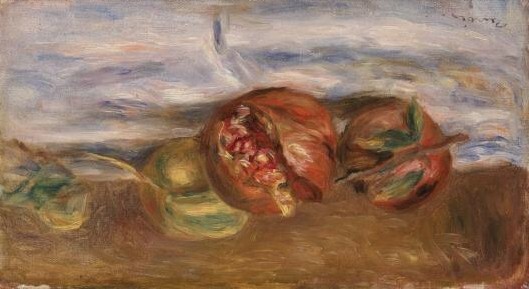 Renoir and Soutine were interested in very different qualities. "Vive la difference."